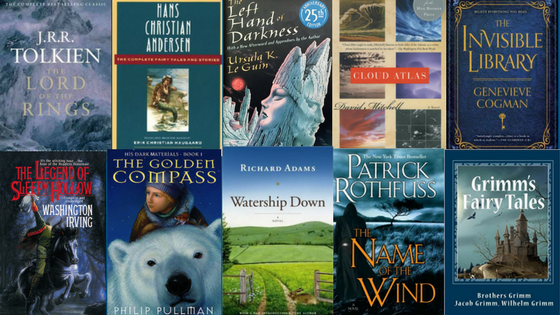 Fantasy fiction is defined as "a genre of imaginative fiction involving magic and adventure, especially in a setting other than the real world." "Fairy tales are a part of the world’s vast common stock of stories, literally folktales. Fairy tales have, however, their own special quality and not all folk tales are fairy tales. The essence of a fairy tale is a story of growing up, maturation, usually with a strong element of wish-fulfillment by way of fantasy, and normally with a happy ending." Text: "fantasy." 1.3. Oxford Dictionaries. 2018, https://en.oxforddictionaries.com/definition/fantasy. Accessed 31 Mar. 2018. Brewer, Derek. "fairy tales." Continuum Encyclopedia of British Literature, edited by Steven Serafin, and Valerie Grosvenor Myer, Continuum, 1st edition, 2006. Credo Reference, http://sc4.idm.oclc.org/login?qurl=https://search.credoreference.com/content/entry/britlit/fairy_tales/0?institutionId=5065. Accessed 31 Mar 2018.